At Create Pro, the Mac Pro 5,1 is our system of choice and the same goes for a huge number of creative professionals. But why is this? Why do so many audio, video, 3D & still image professionals choose to employ the Mac Pro 5,1 workstation? There are many reasons for the classic Mac Pro’s continued dominance of the professional market. We’ll explain them today in this post and discuss why the 5,1 is held in such high regard amongst creative users. Before looking at why the 5,1 is presently the professional system of choice. Lets look at where it came from, and the design features that allow it to dominate even in 2015. Initially released in 2010 the Mac Pro 5,1 was the pinnacle of the classic Apple tower design. The 5,1 debuted with a 12 core 2.93GHz processor as the top spec option. By it’s final release in 2012 we saw a 3.06GHz 12 core system. With a custom Mac Pro build in 2015 you can install a staggering 3.46GHz 12 core CPU ensuring unparalleled CPU grunt. Mac Pro 5,1 workstations shipped with an ATI Radeon 5770 1GB GPU and could be upgraded to an ATI Radeon 5870 1GB GPU. Further down the line Nvidia GTX680 and AMD Radeon 7970 Mac editions were released. Nowadays, thanks to the efforts of various EFI programmers around the world, we have a multitude of modern GPU options for the Mac Pro 5,1 encompassing both Nvidia and AMD. The 5,1 could be configured with up to 48GB RAM on a single processor system and 96GB RAM on a dual processor Mac Pro when it was released. With the debut of 10.9, 10.10 and new CPUs we can now add up to 64GB RAM on a single processor system and 128GB RAM on a dual processor workstation. The real strength of the 2010 and 2012 Mac Pro systems come from their internal expandability. The Mac Pro is equipped with 4 SATA drive bays and 4 PCI-E 2.0 slots. This means unrivalled customisation and a never ending supply of new components that make the Mac Pro 5,1 better every year. The processing power of the Mac Pro 5,1 is highly scalable depending on your budget and can easily match the grunt of the 6,1 for just a fraction of the price. We personally stock 4 different CPU options that we believe can fulfil the needs of all users. For those with a thirst for unparalleled power the 3.46GHz 12 core processor will score similarly in benchmarking tests to the Mac Pro 6,1’s top spec processor at just a fraction of the cost. For those that have a smaller budget the 3.46GHz 6 core processor or 12 core 2.66GHz processor will provide impressive power, exceeding that of the Mac Pro 6,1 base models, and still leave change in your pocket. For more information of processors, cores, GHz and CPUs check out our guide to them here. The fact that the Mac Pro 5,1 has PCI-E 2.0 slots means that theoretically the system will keep getting brand new GPU options as new graphics cards are released. This is in contrast with the Mac Pro 6,1, which uses proprietary GPUs meaning you are tied to the option you choose when your system is assembled. It should also be noted that the Mac Pro 6,1 has no Nvidia GPU option, this means no CUDA functionality is available on that system. Most PC cards are compatible with the Mac Pro 5,1 out of the box, they wont however have a boot screen and GPGPU functionality is missing in some cases. This being said, thanks to a number of Mac EFI developers, there is a continual stream of modern GPU ROMs being released that allow PC cards perform as well on a Mac as they do on their PC counterparts, boot screens and all. Below are just a few of the GPU options we offer for the Mac Pro 5,1, all of them run off internal power with no need for an extra PSU. For many users Nvidia GPUs are essential to their workflow. CUDA acceleration provides huge performance boosts in many professional applications (detailed here), and is only available on Nvidia graphics cards. For Nvidia users the Mac Pro 5,1 has no competition. For more information on AMD and Nvidia GPUs, GPGPU, OpenCL and CUDA check out our guide here. Similarly to the GPU department, the Mac Pro 5,1 shines when it comes to storage options. This is due to the 4 SATA bays and 4 PCI-E 2.0 slots which allow installation of HDDs, SSDs and flash storage in multiple configurations. In terms of traditional HDDs, you can install 5 in the Mac Pro 5,1 (4 in SATA drive bays and 1 in the secondary disk drive). With HDD capacities now reaching as high as 6TB one could theoretically install 30TB of HDD storage in a Mac Pro 5,1. RAID cards can also be installed which allow HDDs to be configured in a striped RAID, hugely increasing read & write speeds. Looking at SSD drives, they can be installed on both the PCI-E 2.0 slots and SATA bays. Much faster and reliable than a traditional HDD, SSDs will reach considerably higher speeds than HDDs when in a SATA bay. If you install your SSD on a PCI-E 2.0 slot using an adapter, speeds start to get ridiculous at up to 3x that of a traditional HDD. PCI-E SSDs can be set up in a striped RAID configuration, without the need for a RAID card, if more than one is installed, this will lead to even higher read/write speeds. Finally, the same flash storage that is installed in the Mac Pro 6,1 can also be installed in the Mac Pro 5,1. Flash storage is incredibly fast, reaching read and write speeds over twice as high as regular SSDs. Whereas the Mac Pro 6,1 is limited to a single flash storage blade, the Mac Pro 5,1 can install multiple flash storage drives as you have 4 total PCI-E 2.0 slots. Again these blades can be set up in a striped RAID configuration (without a RAID card), 2 1TB flash blades in a striped RAID can reach read and write speeds of beyond 2,000MB/s. For more information of HDDs, SSDs, flash storage and RAIDs, check out our Mac Pro storage guide here. 4 PCI-E 2.0 slots not enough? No problem, PCI-E expanders are available allowing you to trade a x16 lane for 4 x4 lanes. This means more GPUs, more SSDs, more flash storage, and overall, just incredible performance potential. We stock CUBIX expanders which, for us, are the best on the market. But the 5,1 doesn’t have Thunderbolt? Yes, the 5,1 cannot support Thunderbolt. Is this a big deal? To us, no. The reason why the 6,1,and many other Apple products tout Thunderbolt is that they lack PCI-E 2.0 expansion. The 5,1’s biggest strength is it’s PCI-E expandability and for this reason it does not need Thunderbolt, need extra storage? Install it on the PCI-E slots. Need more PCI-E slots? Install a PCI-E expander. Thunderbolt is a great piece of technology but it still has a few flaws. It cannot support an external GPU, and with no Nvidia option in the 6,1, this is a deal breaker for many users. The 5,1 can thankfully have Nvidia GPUs installed internally & externally. Let’s face it, the only real alternative to the 5,1, the 6,1, is just plain expensive. The 3.7GHz quad core Mac Pro 6,1 model starts at £2,499. At Create Pro, our 3.46GHz 6 core Mac Pro 5,1 starts at just £1,355. The 5,1 can also be upgraded in the future with new GPUs, extra RAM, more & faster storage, and whatever comes out next. The 6,1 is locked into the spec you choose when you order. This means if you want an upgrade, you need to shell out for another brand new system. Not the case with the 5,1 which can be internally upgraded as and when you like, without the need to purchase a new system. In the end, it rings true that size does matter. The Mac Pro 6,1 relies on Thunderbolt for expansion, but the tech isn’t quite there yet. External GPUs are not yet possible meaning no CUDA/Nvidia. The 5,1, however, has bags of room on the inside and can accommodate multiple AMD/Nvidia GPUs, flash storage/SSD RAIDs and a host of traditional SSDs. Regardless of price, the 5,1 simply has greater potential as a workstation due to it’s internal expandability. Bring price into the equation and it’s a no brainer. The 5,1 is highly customisable and great value compared to the current Apple offering. To build your Create Pro Mac Pro today head over to our ‘Configure your Mac Pro’ page now. You may also be interested in our article were we put a custom 4K Mac Pro 5,1 system against the new iMac Retina, check it out here. I always wished I could afford a Mac Pro and I was lucky enough to buy 4,1 Mac Pro which I flashed to 5,1. I am more than happy with it. I have already installed a PCI-E SSD blade and at the moment I’m getting just 450MB/s writes and 725 MB/ s reads, but I’ll invest into it more in the future so I hope I’ll get over magical thousand mark. If you want to break the 1000 barrier we’d recommend the Samsung XP941 or official Apple flash blades. You always get faster speeds on larger capacities. 1TB is always a good bet. The 5,1 is a monster, enjoy! We install 2x X5690 processors in our Mac Pro, so in total there are 12 cores and 24 threads 🙂 We also do a 6 core version with 6 cores and 12 threads. You really can’t go wrong with a Mac Pro 5,1. Super customisable, incredibly powerful, professional workstation. Is the Mac Pro 5,1’s memory speed likely to be its Achilles heel in the near future? At only 1333mhz it’s nearly 0.5ghz slower than the 6,1 and some PC systems are now being built with memory chips with speeds in excess of 2.0ghz. In real world situations RAM speed actually makes very little difference. Certainly nowhere near the difference that having more RAM makes, and nowhere near that of the CPU, GPU & storage speed. RAM speed can have an effect on benchmarks, but as mentioned above, in professional applications, it’s not a significant consideration. As for the 5,1 in particular, it’s strength is customisation. Extremely powerful Xeon processors, modern Nvidia & AMD GPU options, flexible storage options from SSDs, HDDs & flash storage and an upper RAM limit of 128GB. The 5,1 is still the professional users number 1 choice, and we can’t see this change in the near future. I don’t know if this post is old (doesn’t seem to be) but I cant find the “2.66GHz 12 core Intel Xeon X5650” processer on the Configure you Mac Pro page as well as the “our 3.46GHz 6 core Mac Pro 5,1 starts at just £1,355” link doesn’t actually take you to a £1,355 build? We now just provide the 3.46GHz processors as they have always been the most popular, and of course more powerful. A basic 6 core spec is actually now just £1,005.00 (3.46GHz 6 core, 12GB RAM, ATI Radeon 5770 1GB GPU, 2TB Toshiba HDD). Out 3.46GHz 12 core CPU is now actually around the same price that our 2.66GHz 12 core was when this article was written. My biggest concern is future OS/application support for the 5,1 system!? This sad day is surely on its way in the next 24 months, no? I wouldn’t be so sure, Apple only killed support for 32 bit systems in the past because they moved to a fully 64 bit OS with OS X 10.8. The Mac Pro 5,1 is fully 64 bit, the next big thing will be 128 bit, but your looking at decades in the future until that is adopted. As of January 2018 running High Sierra, the 3.46 GHz Dual Core system is still more performance then I need. Thrown in the fact that I also run a supported NVIDIA GTX 980Ti, 48GB RAM (3x16GB 133MHZ), PCI Boot Drive with a bunch of RAIDED Samsung SSD’s, still getting great performance for daily activity. Amazing Value for a system I bought used in 2010. Ability to be secured to immovable object with security cable (and to have internal drives under the same lock) as our data is more valuable than the computer. Two RJ45 Ethernet sockets as standard. It’s an awesome system for pretty much anyone due to the versatility, as you have just explained so well. I have a 2009 8 core Mac Pro 4,1 that currently has a 4gb GTX 680 (Zotac manufacture, flashed for Mac) the problem is I purchased a 27in Cinema Display (Mini DisplayPort version not the Thunderbolt), the GTX 680 does not have a Mini DisplayPort and every adapter I have tried does not display a image on the monitor (I tested the monitor with a MacBook Pro and the monitor is 100% functional). So my question for you is if I purchased a flashed 280x do you think it will work with the 27in Cinema Display? Unfortunately we do not stock the 280X anymore, but we do have the GTX 980 & 980 Ti with Mac EFI which should work fine for you. Email me at tom@create.pro if you need some help with this. nor 1 miniDisplayPort (Mac) DisplayPort (Dell) cable + 1 miniDisplayPort (Mac) miniDisplayPort (Dell) cable. I have a question : is the R9 280X compatible 4K@60Hz with my Mac Pro 5,1 mid-2010 running 10.10.5 and the LG 31UM97B LED 31″ (4K 4096×2160) ? Yes the GPU should be compatible with the LG 31MU97 at 4k 60Hz, basically to get 60Hz the display needs to have DisplayPort connection and be a single panel (SST) display. Over a year and a few months since this article was posted – do you still think investing in a Mac Pro 5.1 system is a wise move? How many years left does this system have in terms of OSX updates? Is it a better long term investment over going with the 5K iMac in the same prices ranges? In our opinion, the Mac Pro 5,1 is still the best option. There is no reason why OS X updates would stop anytime soon, the only systems that are no longer supported are those that are 32 bit. The Mac Pro 5,1 is fully 64 bit and 128 bit Mac systems aren’t even on the horizon yet. No problem Cerven, if you need anything else you can always email me at tom@create.pro. Do you ship to the US? Also, does the 5.1 have bluetooth? We ship free to the US! how many and what cuda gpus can be inside macpro 4.1 or 5.1…..max number gpus for cuda gpu rendering software…octane render etc. Using a Cubix Xpander you can have up to three running on the system! Cerven, I would have to agree with Tom that the 5,1 is still a great option. Just a couple months ago I built up a 2012 5,1 with 12/3.46 cores, 128GB RAM, Titan X 12GB GPU, 512GB PCIE Flash drive for the OS (currently Sierra), and a 1GB SSD for scratch and storage. 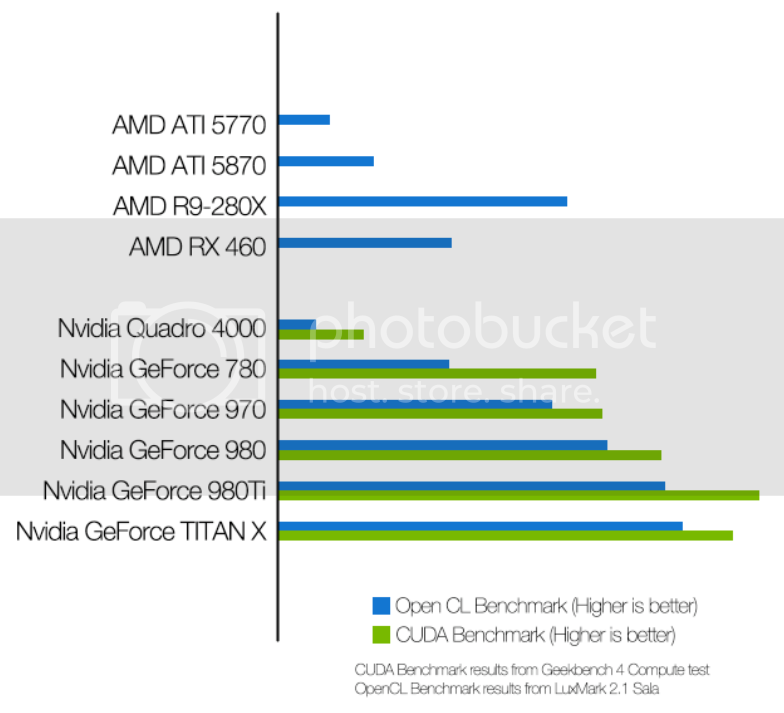 Benchmarks rival the 6,1 for 1/4 the cost and have had no issues. The Titan X is not flashed so I don’t have a boot screen but it isn’t a problem unless I do an OS update then I have to pop in the old Radeon 5770 to reset the graphics driver back to Nvidia web driver then switch back to the Titan. But that is the only minor complication and one by choice to run the awesome 12GB Titan at a lesser cost. A 980ti would solve that and be a great card too. The trashcan 6,1 is a 2013 model and until Apple comes out with something significantly faster I will cruise along with this screaming 5,1. On a style note, no one ever comments on how incredibly well designed and simple to work on the 5,1 is. Super clean design. If anyone ever produces new logic boards that can bolt in to upgrade the 5,1 to newer faster processors and USB 3.0 (or 4.0), PCI-E 3 or 4 and faster memory speeds, that would be interesting. Just a quick question. How is the gtx 980 for editing 4K video in Final Cut Pro? Or even the 980 ti. I have heard that an amd 5870 is better than it. Because of opencl which nvidia cards are not as good at. I would stick with amd, and will do if that is my only option, but I want to move maya from PC to Mac. Just so I can keep all my work related programs on one system. The 980Ti is certainly better at 4K than the 5870. Tom, I recently got one of the final (2012-vintage) stock 4-core Nehalem machines (3.2GHz). I read the bit above about all the 4- and 6-core machines now being able to handle 64GB of RAM, if you’re using 10.9 or newer for your OS. I have got Yosemite running, and got 4 x 16GB DIMMS (proper speed, etc., from a Mac-centric vendor), and the machine will only see/use three of them for a total of 48GB. When I try and use all 64GB, it hangs on boot at the beginning of the grey apple and progress bar. Is there something I am missing that will make the 4- and 6-core machines see and be able to use all 64GB? Plan is to put a GTX 908 Ti in, and run three monitors (card coming on Tuesday!). Got it booting from an SSD in slot 1, there’s a 4TB drive in slot 2, and slots 3 & 4 each have 6TB drives. Also put in an eSATA/USB3 card, got two 4TB external RAID boxes on via the eSATA (who needs Thunderbolt when you have eSATA? ), and a USB3 hub. I plan on keeping this machine alive for a long time…hopefully with 64GB of RAM! Thanks for the inspiration…got the idea to do all this after reading your article! In regards to your RAM its not the operating system which limits how much you can run. The X series Intel Xeon processor which is used in the dual CPU system will support up to 64GB each that is why you can run up to 128GB. We can provide a full run down of model numbers if needed. We fit only the X series processors so you can get the maximum amount of performance possible. The 980Ti is a fantastic cards seriously impressive performance! There isn’t much you really can’t do with the Mac Pro 5,1. If there anything else we can help with just let us know! Great article and webpage discussion. Thanks for reminding and reassuring us of our beloved 5,1 towers. I upgraded a 2010 2.66 12-core to a 3.46 a couple of years back. I have a Vader-tube at work and my 6-year-old machine at home more than keeps up. Don’t know when I’ll be forced to get a newer machine, but don’t plan on it anytime soon. If you are a video editor working in any kind of graphics or non-linear editing, a flashed efi card from any efi developer will have your computer crash while you are working at completely random events. I had one and yes, I tried everything between the earth and the moon for about 6 months praying that this wasn’t too good to be true. And yes MacVid Cards are not different because that is where my GPU came from. It was not quite there fault, however, I am sure they knew about the issue without saying anything. It is an issue with the web drivers from Nvidia and Adobe perhaps or just Nvidia. Doesn’t matter now. All I can say is that you will have to stick with the Sapphire HD 7950 until you leap to the next machine. I can’t decide whether it’s a good idea to buy a 5.1 Mac Pro. 2010 2.93 GHz 12 core 16GB ATI Radeon 5870 video 1GB? Is it too old? What are the concerns I will have? I bought a new 20″ imac G5 years ago for over $3000, and it lasted approximately 7 years. After paying that much $, I felt short changed and no longer want to buy a new imac. I’m concerned that maybe it’s not a good idea to buy a 2010 mac pro from a private seller, in comparison to buying a refurbished imac 21.5 with Retina for a little more, from the Apple website. I want something that will enable me to have good graphic design options, other than Apple’s Pages. We understand your concern and that why we have an exchange program in place specifically so you aren’t short-changed. Please see here our exchange program! I have a Mac Pro 5.1 with two X5670, GTX 680 and 32 GB ram. I also have SSD connect to PCIe via Sata 3. Power of this machine is huge but my problem is with Final Cut X. When I exporting videa Final Cut never use more than 30% of power. I am solving this problem almost three months and still I don’t where is a problem. Do you have any idea? I have a clean instal of last version macOS Sierra. I have a mac pro 5,1 and am running with two GPU’s- the standard GT 120 and the GTX 960, which helps with running multiple monitors on my video editing rig. I am wondering how much I am benefiting from having the small card in there. Would it be better overall if I removed both cards and upgraded to the 980 or 1080ti? I have a feeling it would be, but it would be good to hear from someone who actually knows something. How much is that small card actually doing for me? The GT120 is only really used for your boot screen. The ideal setup would be to run for instance a 1080ti with the GT120 as you get the huge performance plus the little bonus of a boot screen. We provide custom cable kits and GT120s with our high-end Nvidia GPUs for that reason. Damn ive moved to Spain, and have a mac pro 4,1, and would have upgraded it to the 6 core with more ram and perhaps a new gpu, trying to think how to do this.